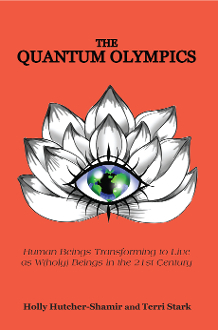 The QUANTUM OLYMPICS is a cutting-edge instructive book that is designed to be supportive and wholistic for living in the 21st Century. Authors Holly Hutcher-Shamir and Terri Stark have spent years collecting thoughtful, proven information and strategies to assist in dramatically changing their lives and the lives of others. Now they have compiled this information in a book so that you can also transform your life! Using the inner lens perspective of client stories, the authors present you with many tools, techniques, and models that can be utilized to guide you in transforming from living as a human being to live as a W(holy) Being. Decode the Mystery of Your Human Architecture by uncovering the layers of your belief systems and inner and outer influences. Build a Wholistic Health Practice that feeds your happiness in being you on a physical, mental, emotional, and spiritual level. Connect to Your Inner Intelligence to cultivate a relationship that you can draw upon as an inner resource. Understand Technology's Influence and Impact on your wholistic well-being. Design Your Performance Model, a personal nine-step plan that integrates your individualized expression, dreams, and goals into the day-to-day action of your life. When you consciously participate in the Quantum Olympics, your soul performance is nurtured by knowing what defines you, how to improve and love your life, and how you can contribute toward making the world a better place.